This great triathlon tradition continues, celebrating 29 years in 2015. Join us at this beautiful Alabama State Park Venue for one of the longest running triathlons in Alabama. 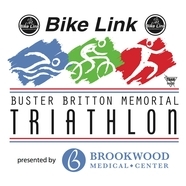 The race honors the life of Buster Britton - one of the Birmingham area's original triathletes that lost his life in a fun run after completing the Hawaii Ironman only a short time earlier. Buster was a true inspiration for triathletes as the sport began to take shape in Alabama.